Tracking the hours for dozens of employees can be a frustrating and time-consuming ordeal. However, there is a way to streamline the process and make it easier and faster than ever. The solution is here as a monthly timesheet template can automatically calculate employee hours with just a few clicks of a mouse. This timesheet template can be downloaded instantly for free below. The timesheet template featured on this site will undoubtedly be the most helpful and spectacular tool a payroll office clerk could ever acquire. The top of the employee time card is reserved for the name of the employee, the employee’s manager, the employee’s email address and the employee’s phone number. The next section is dedicated to the year to date totals for regular hours, overtime hours and total hours. These hours will be automatically calculated after the information has been placed in the appropriate spots in the template. Within each quarter is a subsection for each specific month. All seven days of the week are preloaded in the template. There are columns and rows for each week in the month up to five weeks. There are also columns and rows for overtime hours worked during each week. Filling out the timesheet could not be any easier. At the end of each day, or at the end of each week if you prefer, simply enter the number of hours you worked for the specific day. You will also input any overtime hours you may have worked. At the end of each week, the hours will be calculated by the template and revealed in the “Total Weekly Hours” category. At the end of each month, the totals will be revealed in the total regular hours and total overtime hours categories. 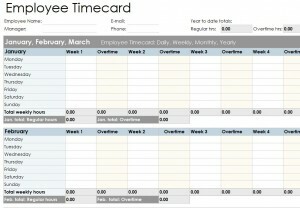 Since it’s an Excel template, the timecard template can be customized however you desire. There is enough space at the top of the template to insert your company logo. The color scheme could also be switched up to match that of your company.